Meet Well, San Diego County Employees! Think about your last work meeting or training. Were there any snacks provided? Was it in-season fruits and veggies, or more processed items, like crackers, cookies, or chips? There’s a new voluntary practice making its way through the County that’s encouraging positive change in the way we eat while we meet. And you can be part of it. It’s called Meet Well – a proud child of the Eat Well Practices, which are “rooted in nutrition and sustainability,” according to Food Systems Specialist Meghan Murphy. Of course, Meet Well is more than just offering up healthy snacks at meetings (though that is a big part of it); it’s also supporting local agriculture by buying locally grown food, ensuring food safety, conducting green and zero-waste meetings (we’re looking at you, metal forks and reusable water bottles), being active, and even providing lactation accommodations at all-day trainings or conferences. Become a Meet Well ambassador – download the Meet Well Pledge template and work with your team to tailor it to your department or branch’s work culture. “It’s an opportunity for different teams or groups to come together and collectively craft what their priorities are going to be to create healthier meetings and events,” Murphy said. In fact, Public Health Services championed the implementation of the Meet Well Pledge by encouraging its adoption by all branches. 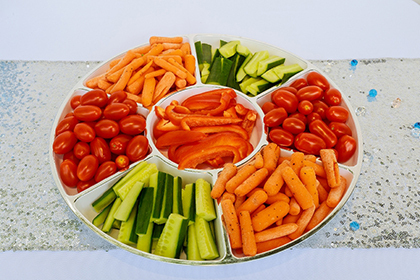 Large County events like the Live Well San Diego Advance and other departments who have recently held all-staff meetings have decided to follow the Eat Well Practices and honor their Meet Well Pledge when organizing these events. You can join them in supporting the Eat Well Practices by crafting your own Meet Well Pledge and having healthy and sustainable events. You can contact Meghan Murphy or Naomi Billups for more information on Eat Well Practices, including the Meet Well Pledge. Do you try to practice more healthy and green options at work? Tell us about it in the comments!